Not many are using smartphones with Microsoft's Windows 10 Mobile, but HP's flagship Elite X3 -- which ships this month -- could boost the OS's sagging fortunes. The premium smartphone will be priced starting at US$699 in the U.S. It feels more like a phablet, but HP believes it could also be a PC in a pinch with its top-line mobile processor, OS and innovative accessories. 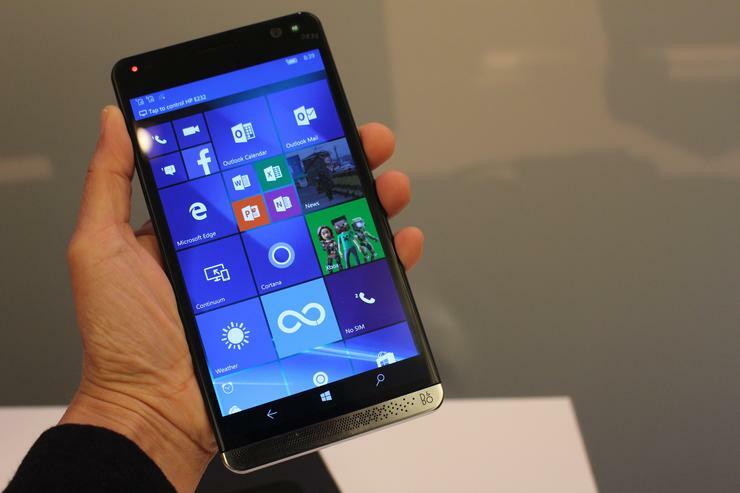 HP first announced the Elite X3 at the Mobile World Congress trade show in February. It has a 5.96-inch AMOLED screen that can display images at a 2560 x 1440 pixel resolution, matching top smartphones like Samsung's Galaxy S7 and LG's G5. The rugged screen has Gorilla Glass 4 technology. The device weighs 194 grams and is 7.87 millimeters thick. Other features include dual-SIM slots, a 16-megapixel rear camera, an 8-megapixel front camera, 4GB of LPDDR4 RAM, 802.11ac Wi-Fi, 64GB of internal storage and a microSD slot for expandable storage up to 2TB. The Elite X3 has Qualcomm's Snapdragon 820 chip, which has a graphics processor capable of processing 4K video. The smartphone also has biometric authentication features like iris detection and a fingerprint reader. The launch signals HP's re-entry into the smartphone market, which hasn't been kind to the company. HP's last big play in smartphones came with the ill-fated 2010 acquisition of Palm, which it jettisoned in 2014. Re-entering the competitive smartphone market wasn't an easy decision for HP. But as a premium device, Elite X3 fits into HP's plan of selling high-priced, high-margin devices to professionals and businesses. There are no plan to sell budget handsets. The Elite X3 can deliver a PC-like experience when the mobile version of Windows 10 is in Continuum mode. It's much like the experience Microsoft has portrayed with some of its Lumia handsets. The Snapdragon 820 chip can deliver adequate processing power, though it doesn't match the capabilities of Intel's Core PC processors. It'll be possible to connect an external display and accessories to the smartphone via a Desk Dock accessory, which HP will sell with the Elite X3 for $799. Users get the desktop feel when browsing the web or editing Microsoft Office documents. The dock has a DisplayPort port, an Ethernet slot, and USB-A and USB-C ports to attach a keyboard, mouse or external storage. HP will also sell an accessory called Lap Dock to turn the smartphone into a laptop. The laptop accessory has a 12.5-inch full HD display and keyboard, and it can be hooked up to the Elite X3 wirelessly or through a USB Type-C cable. Over time, HP will help companies export desktop applications into Microsoft Azure cloud as it tries to make Elite X3 a more viable PC alternative. Elite X3 users will be able to run cloud-based desktop applications via HP Workspace, a virtualized desktop program. The smartphone will ship in many countries including the U.S., HP said, without providing specific details. Windows phone shipments totaled 2.4 million in the first quarter of 2016, which gave the OS a meager 0.7 percent market share, according to Gartner. That's a decline from 8.27 million units shipped in the same quarter in the previous year, which was a 2.5 percent market share. Windows was behind Android smartphones, which held a 84.1 percent market share with 293.8 million units shipped, and iOS, which held a 14.8 percent market share with shipments of 51.6 million units.